The Lost Dominion Screening Collective: Title change for Jan. 19th SCANNERS! 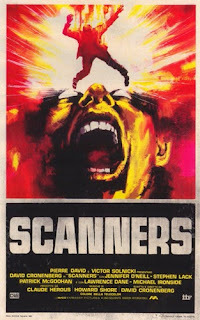 Title change for Jan. 19th SCANNERS! Unfortunately Alliance Atlantis who told us a while back they had a 35mm print of Le Confessional has now told us they infact do not have one or own the rights anymore. We had to make a quick change as the Mayfair is printing their January schedule early because of the holidays. We will now be playing David Cronenberg's Scanners as the second show on Jan 19th at 8:45pm. Scanners, 1981, 35mm print, directed by David Cronenberg, the print is supplied by the Library and Archives Canada.